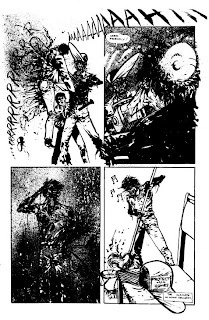 Still working on Sam Costello's strip for SPLIT LIP. Finally on the inking, so I'll be posting sketches and stuff next week probably. 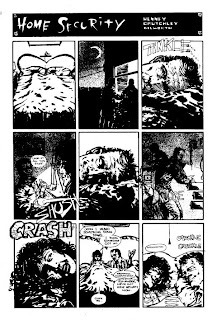 But I thought I show another old strip done 20 odd years ago, again printed in Gore Shriek. I'd sold a couple of stories to them (one was posted a while ago on this very blog) and was keen to sell more. Around this time there was a group of us doing this for fun and profit. 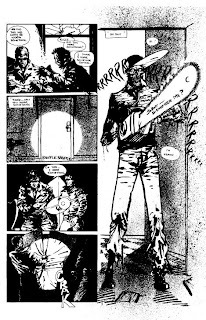 Friends, Mark Buckingham and Matt Brooker had just begun their professional careers, Andrew Yoxell was still doing amazing things with the small press. We were travelling to London to go to the Society Of Strip Illustrators where we'd meet Neil Gaiman. David Lloyd, Garry Leach and loads of other talented artists and writers. So it were great days indeed. There were a couple of friends who weren't actively involved in doing comics, but still read them, and were very interested in the whys and wherefores of doing comics. One such person was me old mate Dave Henney. Lovely man, cracking mate, a bit prone to the odd volatile rant (but who isn't) but would do anything for you. The times that man has been there for me, well... too many to count. Anyway Dave being Dave saw that we were all writing and drawing these funny books and thought to himself that it looks a bit easy. So he bet Andrew Elliott (another corker of a mate and terrific writer) that he'd have a go at this writing lark. And write he did, a fair few gems including this one. I read it, thought I'd have ago drawing it and here we are. Den Dilworth inked it and I sent it of to Tom Skulan and Steve Bissette (editors of Gore Shriek. It's all about the contacts and who you know in this biz.) I'd already sold a couple of tales and I thought they'd go for this one. and Dave was over the moon. 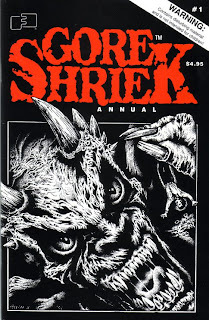 He won the bet (he usually does) and it was printed not in a regular issue of Gore Shriek but in the annual no less. The only problem was that page 2 and 3 were printed the wrong way round. I present Home Security by Dave, Ben and Me. I hope you enjoy it. We were vastly proud of this (ahh the naivety of youth). Dave doesn't write any more, but I was glad I was there when he dipped his toe. Nice one, Gary. Great pacing and great art. I always think that anyone who can tell a tale in one, two or three pages deserves a right royal pat on the back. Thanks for the kind comments on my stuff too. the vid was shorter than I expected coz the memory was full...ahh technology:) It took 15 mins to upload though...is that right??? Cheers. It was a long time ago but it was fun to do. I think, if you can nail the short story then you can have ago at anything. And I hope you clear up some memory soon because I want to see more.